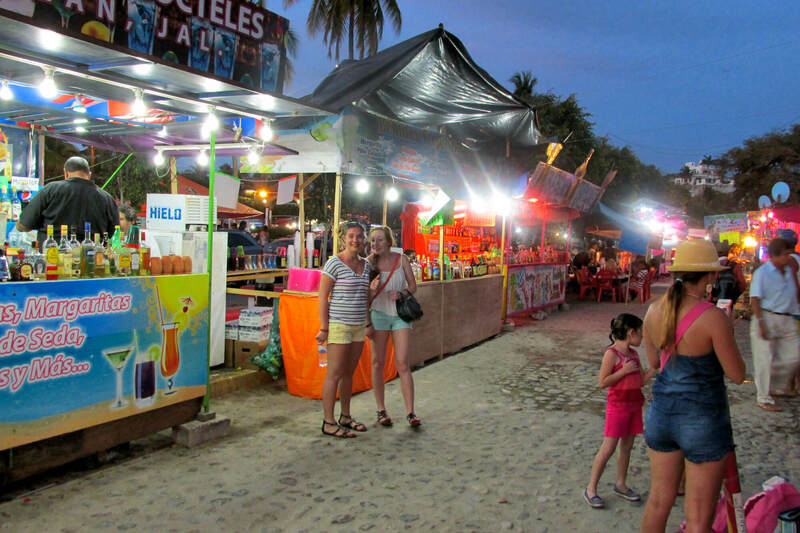 Whether you want to kick back in a lounge chair at the beach and have them bring you a bucket of beers or you want to barter with the locals in the market place for a prized souvenir, Bucerias is our top choice for visiting an authentic Mexican town. The people are ridiculously friendly in this little town at the north end of Flamingos beach. The action centers around the local square where the historic church takes center stage. When you want to grab a bite to eat (off the resort), head over to Bucerias which is just a short walk or cab ride away. Here are our Top 10 picks…if you find a gem not listed here or want to leave a restaurant review, simply do so in the comments section below. This Mediterranean style restaurant offers a wide array of Greek family favorites served up in an eclectic design courtyard. And the adjacent boutique is the perfect place to shop and pick up some local treasures for friends and family. This beachfront restaurant is the perfect place to grab breakfast or an excellent dinner as you watch the sunset over the Pacific ocean. Don’t miss their Sunday brunch and be sure to make reservations since this place is quite popular. This quintissential, romantic Italian restaurant offers excellent cuisine along with great views of the Pacific ocean from the outdoor terrace. Opens for dinner at 6 PM (and seasonally for lunch as well). Be sure to make a reservation. This home restaurant is tucked away in a neighborhood about 4 blocks from the beach, but it is well worth the short walk. Be sure to try the fish tacos and the refreshing frozen lemonade blended with fresh basil! We normally go for lunch, but have heard that dinners are equally delicious. A great little place for breakfast and lunch. Don’t miss the omelets, biscuits and gravy, and the artisan breads that you can purchase to enjoy later. This little Italian gem is within easy walking distance or a VERY short cab ride of Villa La Estancia. 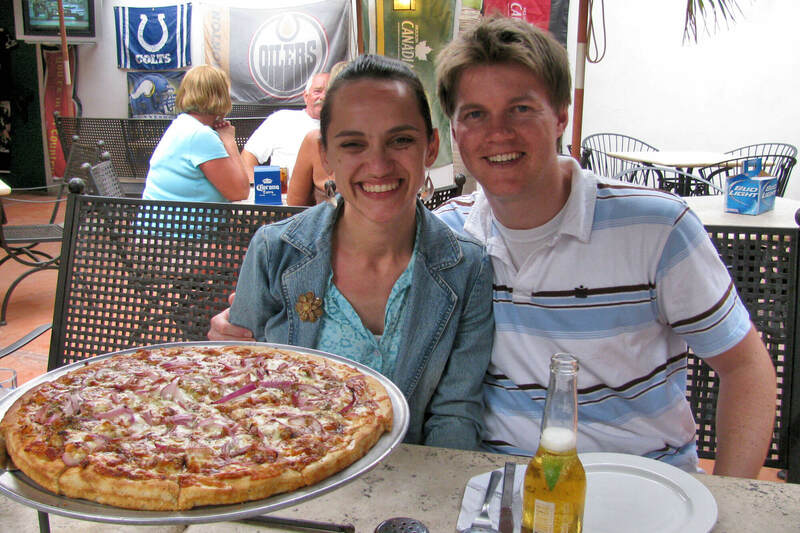 We LOVE their thin crust pizza! Their other dishes are also pretty good. Opens for dinner at 6 PM. When you want to relax and have a fun night out, check out this Canadian-owned sports bar. The service is friendly, beer is cold, and the pizza is yummy. What more could you ask for!?!? When you are looking for an indulgent treat, head to Pie in the Sky to get a Beso. This triple chocolate brownie features a mocha lava center that should be paired with vanilla ice cream. OMG! They have other dessert offerings, but nothing beats the beso. This chain restaurant serves up awesome spit-fired whole chickens served with fresh corn tortillas and salsa. Don’t miss the cheese covered baked potatoes that are equally as good. Tuesday nights, they have a buy one chicken, get a half free deal. AND they will deliver directly to VLE…simply have the concierge call in your order. When you want to get authentic Mexican food, head over to Rosa Mexicano. They serve up traditional dishes with seating in a lovely courtyard area. My tip – be sure to wear bug spray if you are going at dusk.